What does Consensus Revenue Expectations look like for Q4 ’17 and 2018 ? Here (above) is one of the navel-gazing-esque spreadsheets put together on long weekends to examine a data point that might be interesting both to me and readers. 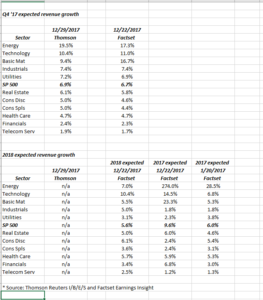 The goal was to simply look at Q4 ’17 and 2018 SP 500 revenue estimates by sector for both Thomson Reuters I/B/E/S and Factset and see what we can see, since there is so much talk about SP 500 earnings today, and yet not much about expected revenue growth. First of all, for Q4 ’17 financial results which start in two weeks, Q4 ’17 revenue growth has converged for both Thomson and Factset, so both are telling the same story, EXCEPT for Basic Materials where there is a big difference in revenue growth. Thomson Reuters I/B/E/S doesn’t disclose forward revenue estimates, (although they will provide the data if requested) but Factset does a good job tracking revenue estimates for multiple periods. Note the bottom half of the spreadsheet, and particularly the last two columns on the spreadsheet. While Energy sector revenue was a big surprise in ’17, note too Technology and more importantly Basic Materials. Basic Mat is just 3% of the SP 500, but aluminum, copper, even gold to some extent I would think contributed to Basic Mat strength. The weak dollar contributes to both Technology and Basic Materials as well. Over half of the Tech sector’s revenues are non US. Finally, look at Financial sector revenue growth: for those clients expecting a repeat of 2008 in the Banking / Financial sector, a lot of that capital market trading activity is gone. Look at the struggles Goldman is having with the Fixed Income, Currency and Commodity (FICC) segment. In 2017, the Financial sector generated roughly 2(x) what was expected 1 year ago. 2018’s revenue growth expectation for Financial’s is about what was expected in 2017. Remember, writing about a topic forces me to take a much closer look at the data than might otherwise be the case. Q4 ’17 is expecting roughly 7% SP 500 revenue growth and for full-year 2018, roughly 6% is expected. Expect an upward drift to both over the next few months.